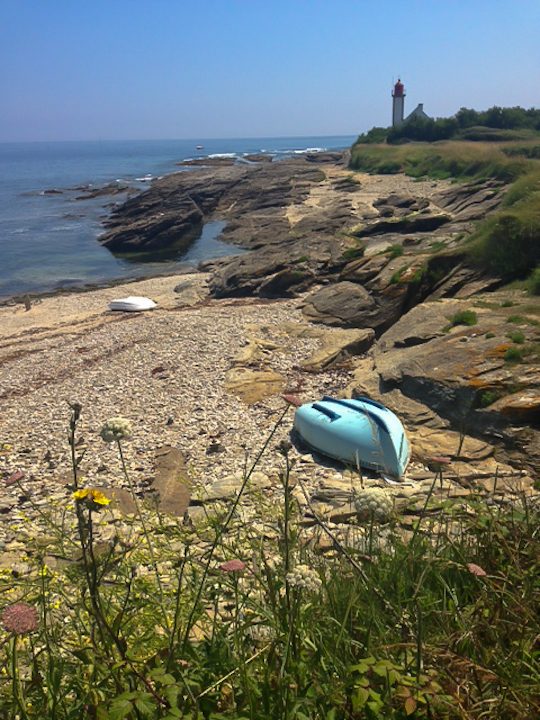 I thought that with all this wintery weather, a flashback to my day on Île de Groix this past summer would be an encouraging topic for this week’s post. Île de Groix is an island not far off the coast of Lorient, on the western end of Brittany’s Morbihan department. After Belle-Île-en-Mer (the topic of a post to come soon! 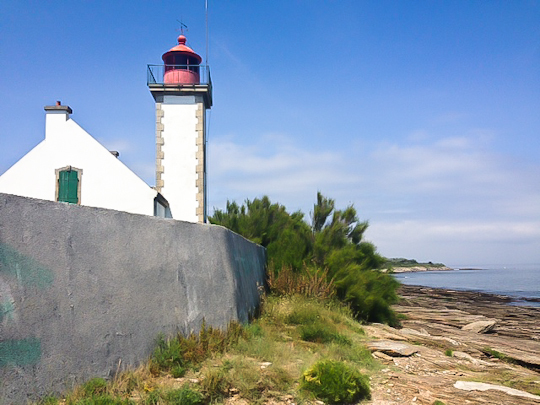 ), Île de Groix is the Morbihan’s second largest island. Compagnie Océane runs frequent ferries (about 45 minutes’ ride) between the island’s main port, Port Tudy, and the city of Lorient on the mainland (accessible by TGV from Paris). I suggest purchasing tickets in advance just to be safe, but if you are leaving the car in Lorient and traveling to the island by foot (which is my strong recommendation), there’s no need to book too far in advance. This island is full of history, from the ancient megaliths to the legacy of the strong tuna fishing and mining industries to the remains of the WWII German bunkers. 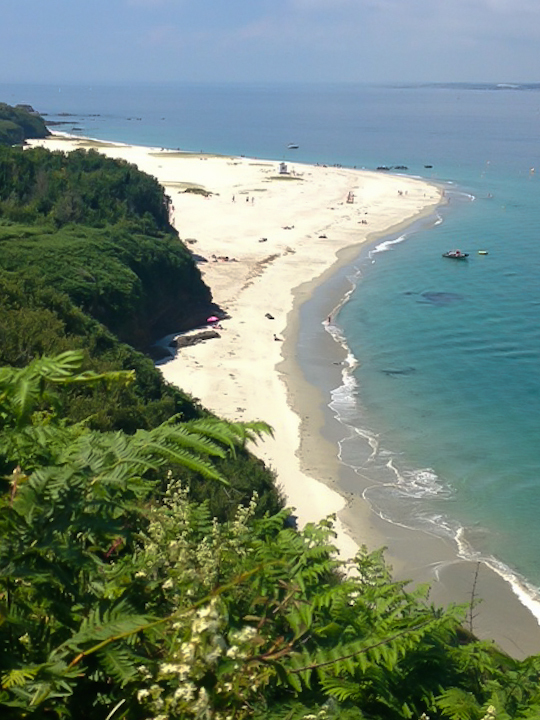 But you can easily forget that you are in Brittany; there are parts of the coastline that look almost tropical, with turquoise water and white sand beaches. 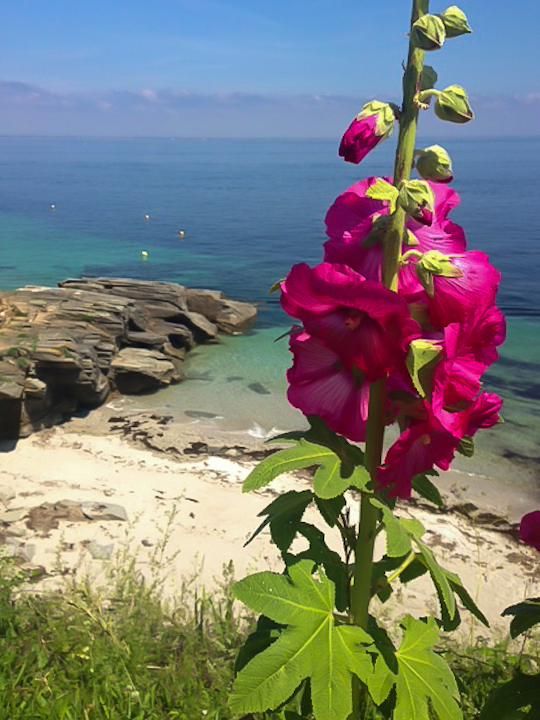 Similar to most of the islands off the Morbihan coast, the north side of Île de Groix boasts high cliffs, while the southern side of the island is home to larger sandy beaches. That being said, the most famous of the island’s beaches is in the northeast, an easy walk from Port Tudy. The breathtaking Plages des Grandes Sables make up Europe’s only convex beach (see the photo just above and the photo just below). In addition to the island’s famous beaches and cliffs, it is known for two thunder holes in the south: Trou de Tonnère (thunder hole) and the Trou d’Enfer (hell hole). The island also houses several nature reserves. 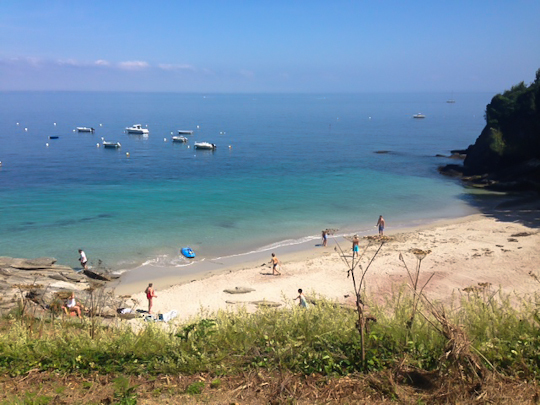 It’s about 27 kilometers or 17 miles around Île de Groix on the coastal path: doable in one day for the more ambitious, but there are certainly other options for those who aren’t obsessive walkers like me. You can rent bikes on the island. While bikes are not allowed on the coastal path (or technically on any coastal path in Brittany), you can travel from point to point on the coast by traversing the center of the island. You can also explore closer to the port, or take a local bus part of the way. 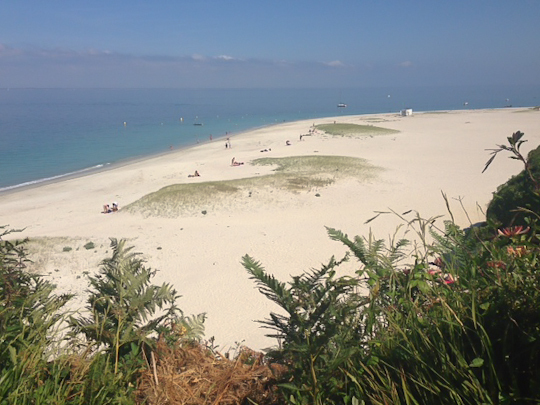 Île de Groix is truly a magical place, well worth a day trip, if not a longer stay. 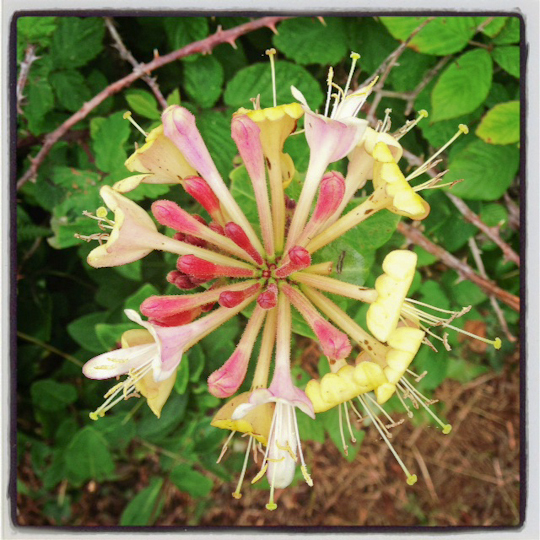 In the meantime, you can watch this video for a sneak preview of what awaits you on the island.